Before you start... the Windows SMTP service must be active. 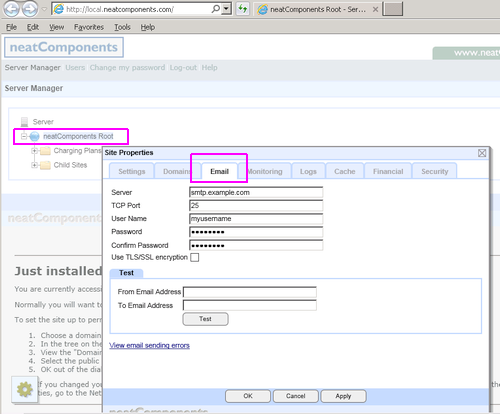 Set up neatComponents email service. neatComponents makes extensive use of email to transfer data, and also to provide a password recovery service. You should configure the email service promptly after installing neatComponents. You would normally configure neatComponents to send email messages to your corporate mail-server or your Internet Service Provider's email service for onward delivery. The minimal entry will be to set the Mail Server (mail-host) and Port - normally 25. You may also add SMTP Authentication (User Name & Password) and change the SMTP port if required by your ISP. Do not enable 'Use TLS/SSL encryption' unless required by your ISP or mail server. If your version of Windows includes an SMTP server (on 127.0.0.1 - localhost) then nC uses that by default. You will probably need to change this default to a full mail server to successfully send email. Always use real, valid email addresses when testing. Do not, for example use: asdf@example.com as most mailservers will do a reality check before accepting or sending a message. Use the [Test] facility in the dialog shown above to send an trial message. Always click the [Apply] button after making a change. This will show whether you have access to mail services on the machine and whether you have configured the connection correctly . Send a test message to your regular email account. If you receive it within a few minutes or so, then all is well - don't forget to check your 'spam folder' too. If you do not receive your test message within a reasonable time you will need to resolve the issue. Click the 'View email sending errors' link in the dialog to see details of any errors between neatComponents and your email server. that means there is not a mail server available at the Server location set in the dialog shown above. This can happen if you do not enter the server location correctly, or if you leave the default value of 127.0.0.1 and there is not a mail server on the same machine as neatComponents. It is often necessary to open Port 25, or other designated port, on your firewall or router. If you think this is an issue we explain how you can test using Telnet. Norton, Symantec etc may block email traffic either on a port-basis (above) or on a program-basis. You will need to set an exception in your anti-virus software to allow your email. Many anti-virus systems will have a 'pop-up' asking for authorization, or something similar. In a corporate or organization environment you should send messages via your company's email server. You should talk to your Mail Administrator to ensure your settings are correct, and that your messages will not be rejected. Small business and home users can install their own mail server, such as Mailtraq, or send messages to their ISPs SMTP service just like using Outlook™ or any other regular email client. If you don't have a regular SMTP service available then there are free alternatives. Google allow you to send mail via their mail server if you have a free account with them. Read the knowledgebase article: 'How to use Gmail as a SMTP host' . You can install your own email server on the same EC2 instance as neatComponents. We fully support Mailtraq (bundle pricing available) and it should work with minimal configuration beyond its own getting started wizard. The form will arrange for rDNS records to be associated with your Elastic IP address, to ensure your outbound mail does not get blacklisted.